Despite their voracious eating habits, my kids are small. Clinging to the bottom of that percentile chart at the doctor’s office. So it’s no wonder that while my three-year-old is a great fan of the ocean, without much meat on his bones, he gets cold easily. Enter the wetsuit. With a husband who surfs, I’m familiar with the neoprene bodysuits, but hadn’t considered them as an ideal solution for my toddler. They keep him warm. They protect him from the sun. They start to prepare him for becoming a world-renowned surfer who’ll make millions getting barreled in the waves of exotic waters and will be ever-grateful to his parents for getting him that first wetsuit. I jest…mostly. 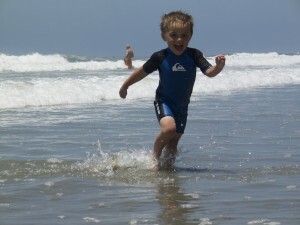 So where does one find a tot-sized wetsuit? Your local big box store might have something that vaguely resembles a wetsuit, but don’t be fooled. Go with a pro. Quiksilver has been making wetsuits, boardshorts and other surf gear since the 1960s. 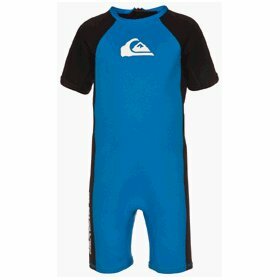 Their Toddler Shorty Springsuit offers easy maneuvering, great sun protection, and good heat retention at an affordable price ($32). And if your kids are like mine and like to become one with the sand and cover themselves with beach dust, such a wetsuit keeps the sand some out of some um, inopportune places. Plus kids look downright adorable in them. For something a bit lighter, check out Quiksilver’s short and long-sleeve rash guards or visit www.quiksilver.com to find summer apparel for the whole family.